Andrew R. Wheeler (born December 23, 1964) is an American lawyer, former lobbyist. He is the Administrator of the United States Environmental Protection Agency (EPA) since February 28, 2019. He was the acting head of the agency from July 9, 2018 to February 28, 2019. Wheeler was an aide to U.S. Senator Jim Inhofe. Wheeler is a critic of limits on greenhouse gas emissions, denies Global Warming and the Intergovernmental Panel on Climate Change. In October 2017, Wheeler was nominated by President Donald Trump, renominated in January 2018 and confirmed as Deputy Administrator of the EPA in April 2018. On July 9, 2018, Wheeler became the Acting Administrator after the resignation of Scott Pruitt. 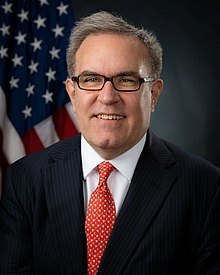 On November 16, 2018, President Trump announced he would nominate Wheeler to serve as the EPA's permanent administrator. His nomination was confirmed by the Senate on February 28, 2019. ↑ U.S. Environmental Protection Agency. "EPA's Deputy Administrator". Retrieved April 23, 2018. ↑ Mufson, Steven (July 5, 2018). "Scott Pruitt's likely successor has long lobbying history on issues before the EPA". Washington Post. Retrieved July 5, 2018. ↑ Farrick, Ryan J. (July 26, 2017). "Trump Nominates Coal Industry Lobbyist Andrew Wheeler To Help Run EPA". Legal Reader. Retrieved August 25, 2017. ↑ Friedman, Lisa (October 5, 2017). "Trump Nominates a Coal Lobbyist to Be No. 2 at E.P.A." New York Times. Retrieved October 6, 2017. ↑ "PN1084 — Andrew Wheeler — Environmental Protection Agency (115th Congress, 2017-2018)". U.S. Senate. Retrieved January 29, 2018. ↑ Mufson, Steven; Dennis, Brady; Grandoni, Dino (April 12, 2018). "Senate confirms a former coal lobbyist as Scott Pruitt’s second-in-command at EPA". Washington Post. Retrieved April 13, 2018. ↑ "Trump Says He'll Nominate Andrew Wheeler to Head the E.P.A." ↑ "Senate confirms Andrew Wheeler as EPA administrator along mostly party-line vote". This page was last changed on 28 February 2019, at 21:26.